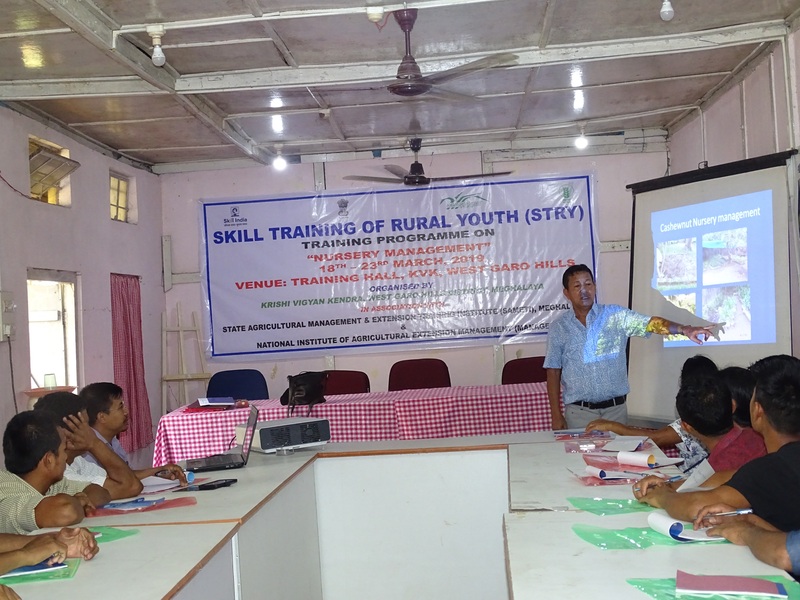 Krishi Vigyan Kendra,West Garo Hills in association with State Agricultural Management and Extension Training Institute (SAMETI), Meghalaya and National Institute of Agricultural Extension Management (MANAGE), Hyderabad successfully conducted 6 days Skill Training of Rural Youth (STRY) programme on the topic “Nursery Management” from 18th – 23rd March, 2019 at the Training Hall, KVK, West Garo Hills. The programme was funded by MANAGE, Hyderabad and SAMETI, Meghalaya. 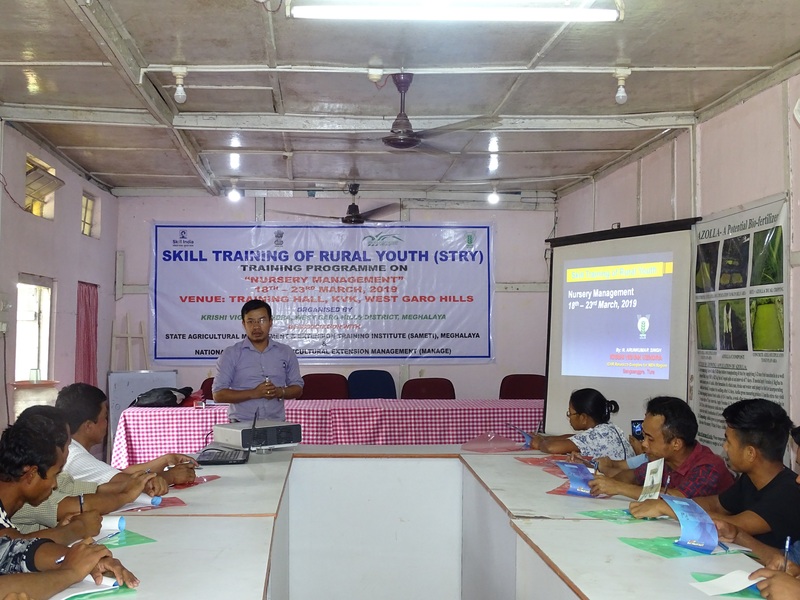 A total number of 15 rural youths from three different villages of West Garo Hills district participated the programme. The programme started with welcome speech by the course director Shri Naorem Arunkumar Singh, SMS (SWCE) KVK, West Garo Hills briefing about the aim and objective of the programme. The course director and Shri A.S. Singh, Retired Horticulturist as resource person covered different topics on nursery mngt. viz. Nursery management of sali (SRI, ICM methods) and boro paddy, nutrient mngt. in Paddy, nursery raising techniques of winter vegetables, nursery mngt. of fruits, flowers and a practical method demonstration on cultivation of vegetables was also conducted at demonstration field of KVK so as to upgrade the skill and knowledge of rural youths in the field of agriculture. 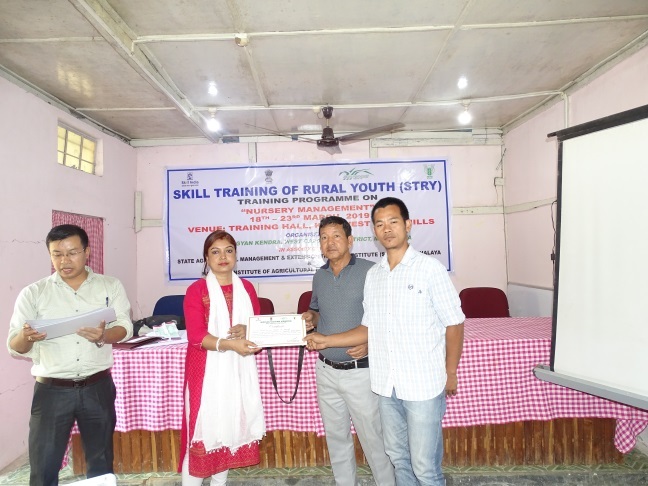 The programme was ended with the distribution of certificates to the participants by Dr. Joyoshree Mahanta, Senior Scientist & Head (i/c), KVK, West Garo Hills, Meghalaya.